Magento is one of the most popular e-commerce development platforms, due to its ability to mould according to the requirements, is the same reason why numerous developers and various eCommerce business verticals have accepted this trade name. Why own a Website that isn't Customised to Business Requirements? WebAppMate is one of worldwide programming enters of experience. If you want to improve your business and take it to the higher levels, you must go through the customization process for your Magento e-commerce store. WebAppMate provides the flexible solutions as per client�s expectations. While you can customize your Magento e-commerce website yourself, or through a developer, what if it did not come out the way you perceived it to be. So, we would recommend you to stop hitting in the dark and come to us with your requirements. Let us discuss about the functioning of us. Since the solutions offered by theus are flexible, they can provide you with the ideal solutions that can flawlessly integrate to your business needs. We have earned an excellent reputation in the industry through broad acceptance of these solutions. Our team of skilled and expert developers is proficient in providing various development as well as Magento theme customization services and solution that help the client to design a powerful online store that can attract massive traffic and hence the potential customers for your Magento e-commerce website. The customized solutions offered by us are great tools for accomplishing the desired efficiency and accuracy by optimizing the parameters and pre-defined styles as per your business needs. Whether the payment structure or shopping cart, product display layout or checkout model, our solutions can help you improve your sales significantly. We, at WebAppMate, fulfill your every need of customization, even the minute alterations. We believe in providing specialized solutions as per your business model. 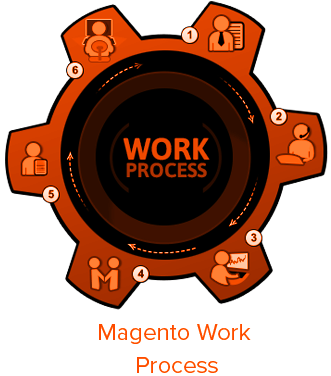 Along with this, we also provide you several unique performance optimization services that offer an excellent experience to the visitors of your Magento online store. We render our client with the most affordable solutions and services in the industry, with reasonable price tags. Here is the array of our customized services to select from. We modify your Magento online store through our various customization blueprints and deliver you the best functionalities. We provided our clients with numerous themes and layout options and customized them as per their store requirement for the improved look of the Magento e-commerce website with enhanced product organization along with the impressive description. Our professionals design and develop the required functionality for your Magento online store that can easily be integrated with the website to boost the performance and upgrade the serviceability. We offer our clients with the performance based customized solution that provides the users of their Magento e-commerce store much faster loading of the pages along with higher navigation speeds. We, at WebAppMate, help our clients to develop a robust infrastructure for their Magento e-commerce stores to reach their business objectives successfully. We provide you the development of your online store with limited features necessary to make it �up and running� instantly. We also provide the excellent administrative solutions to our customers that can be customized as per their Magento store requirements and let them manage their web content efficiently and easily. We not only provide customized solutions for your online store but also give it an attractive and impressive appearance so that it can engage the online user immensely. We help our clients in extending their business by integrating the third party software tools or plug-ins, so that they can upgrade the web application to boost the performance further. Our experts offer significant assistance in providing the Magento migration platform and fulfill every related need during migration of your online store.